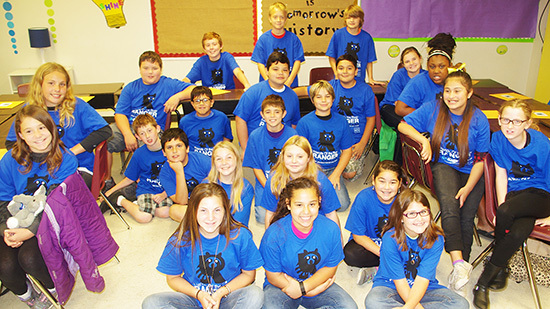 A FOR Ranger presentation was held on Tuesday, May 17, at Wild Peach Elementary School. 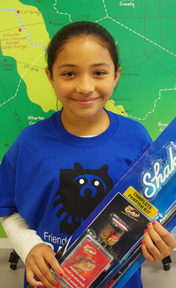 Forty-eight fifth grade science students learned about the San Bernard River watershed and its environmental concerns. Points-of-interest along the river were also discussed. A fish identification of species found in the river followed and then “mostly-true” fish tales were reeled off by the students. Last on the program was an active nautical knot tying session where students learned the proper knots to secure a boat to a dock. ^^ Kandi Eakin, center, Wild Peach Elementary School teacher is flanked by FOR Ranger Committee members, l. to r., Valroy Maudlin, class assistant, Ken Wright, nautical knot typing instructor, Adalia Maudlin, watershed instructor, Ange Ronayne, class assistant and Bob Bailey, fish identification instructor. 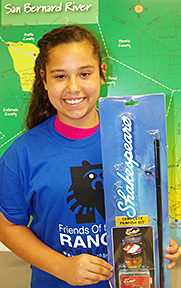 << Two students won fishing rod and reels after their names were drawn at the end of the class. 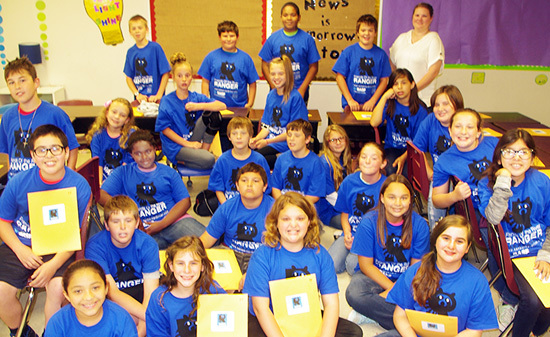 Each student also received a packet of information containing San Bernard River watershed information and a FOR Ranger t-shirt.